President Barack Obama's prime time press conference having done little to reassure a wavering public, it seems the Democrats hope to create a national healthcare system may once again have slipped out of out reach. The president agrees that his timetable has been thrown off and Senate Majority Leader Harry Reid, D-Nev., says they won't take up the issue before the recess despite the fact that he has a filibuster-proof majority of Democrats behind him. The committee process in the House has ground to a standstill, with the less liberal "Blue Dog Democrats" almost in rebellion against House Energy and Commerce Committee Chairman Henry Waxman, D-Calif., over the cost of the so-called tri-committee health care proposal. Privately, the word is moving through Washington that the White House is prepared to abandon the idea of the public option that is causing so much concern, particularly in the medical community, which is not likely to endorse anything that leads to further federal price controls on healthcare. Though House Speaker Nancy Pelosi, D-Calif., claims to have the votes to pass a package of legislation—and White House Chief of Staff Rahm Emmanuel insists Congress will vote on health care reform next week before it adjourns for the August recess—things look very bad, with the majority growing more desperate as the days pass. A clear sign of their growing desperation is the way in which the Democrats are censoring the GOP's official communications to their constituents. On Thursday Roll Call reported the majority party is "preventing Republican House Members from sending their constituents a mailing that is critical of the majority's health care reform plan." —developed by Republican staff of the Joint Economic Committee at the direction of Rep. Kevin Brady, R-Tex., which the majority claims is inaccurate. 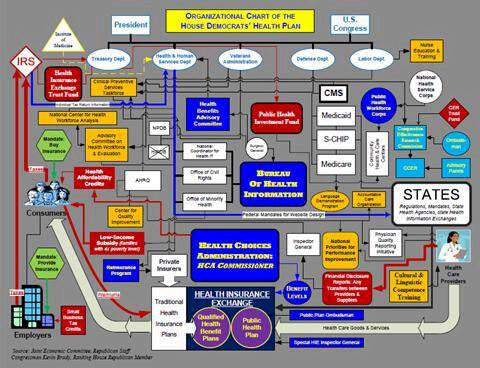 Brady labeled the criticism, delivered in an eight-point memo, "laughable," saying the chart "depicts their health care plan as their committees developed it." At the same time comes word from Rep. John Carter, R-Tex., that the same franking commission that is causing problems for Brady's chart won't let Carter use the words "government-run heath care plan" in a recording to be used to start a telephone town hall meeting. "What we proposed as language was as follows, 'House Democrats unveiled a government-run health care plan,'" Carter told a conservative publication. "Our response from Franking was, 'You cannot use that language. You must use, 'The House majority unveiled a public option health care plan,' which is Pelosi-speak or 'just last week the House majority unveiled a health care plan which I believe will cost taxpayers...'"
Republican staffers say this kind of censorship of the minority by the majority is almost unheard of on Capitol Hill, certainly during the years the GOP was in power. Moreover, they say, it is a clear sign that the Republicans are, for the moment, winning a fight once thought unwinnable. Rather than get them down, they are taking the efforts to suppress their message as a badge of effectiveness. Did House Democrats Buy Moderate Votes on Global Warming Bill? Back in the days when the Republicans controlled the U.S. House of Representatives, the Democrats repeatedly accused them of abusing the power of the majority to further their agenda. In one particularly onerous charge, repeated for days in the media, they accused the GOP of trying to "buy" the support of then-Rep. Nick Smith, R-Mich., for President Bush's signature Prescription Drug Reform package with the promise of campaign contributions for his son, who Smith hoped would succeed him in Congress. To show how seriously the Democrats took the issue, then-House Minority Leader Nancy Pelosi, D-Calif., stood in the well of the House in December of 2005 to offer a privileged resolution which, in part, accused the Republicans of "bullying and threatening Members to vote against their conscience." Pelosi's resolution, which also accused the Republicans of "violat(ing) their own rules and the customs and decorum of the House to win votes," called on then-Speaker Dennis Hastert, R-Ill., to take whatever actions might be necessary to prevent further abuse of the House rules. But that was a long time ago. Things are different now that Pelosi is Speaker and the Democrats have a comfortable majority—or are they? On Friday Politico's Mike Thrush reported on what the publication called a "Big Dem cash dump on eve of climate vote." Thrush wrote that, "Three House Democratic leaders who were whipping members on the climate change bill gave tens of thousands in campaign cash to party moderates around the time of the 219-212 vote on June 26, according to Federal Election Commission records." And one of those leaders doling out money was, don't get ahead of me, Speaker Nancy Pelosi. Thrush does allow that not all those Democrats who got money voted to pass the Waxman-Markey legislation but the timing of the contributions is suspicious. Rep. Henry Waxman, D-Calif., who co-authored the bill, and who gave at least $16,000 in contributions to members who voted "Yes" on his bill, said through a spokesman that the contributions were nothing more than the usual "end-of-quarter activity." Which sounds a lot like the kind of thing the Republicans might have said when they were in the majority. Sotomayor Does Not View the Constitution as "Settled Law"
An exchange between Wisconsin Democrat Herb Kohl and Sonia Sotomayor during her first day of testimony before the Senate Judiciary Committee made me think of Animal House. Kohl, who before becoming a constitutional scholar was the owner of a professional basketball team, quizzed Sotomayor on her views about privacy as relates to the U.S. Constitution. "As you know Judge," he asked Sotomayor, "the landmark case of Griswold v. Connecticut guarantees that there is a fundamental constitutional right to privacy as it applies to contraception. Do you agree with that? In your opinion, is that settled law?" "That is the precedent of the court, so it is settled law," she said. Over the weekend the McClatchy news chain reported that supporters of Supreme Court nominee Sonia Sotomayor were urging members of the Senate Judiciary Committee to attack "troubled and litigious work history" of firefighter Frank Ricci, the lead plantiff in the workplace discrimination case upon which, in essence, Judge Sotomayor recently ruled - and on which she was overturned by the United States Supreme Court. To be clear -- attacking first responders in an effort to burnish the credentials of a presidential nominee for any office is a bad strategy.